Aceh Province is located in the most western part of Indonesia and it becomes ones of the most recommended tourist spots for tourists to visit. Apart from the culture, it is famous for the historical tour! Here is an example. An old structure resides in Kampung Baru, Baiturahman Sub-District and it belongs to Banda Aceh City. The name is Meuligo or Mahligai Aceh, which is actually a governor residence of Aceh. 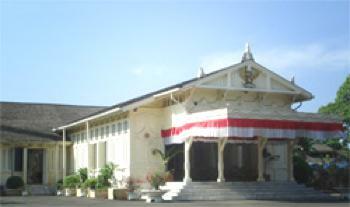 As the name implies, it is the home of the governor and has been used by the governors since the era of Dutch East Indies. Once tourists arrive at the location, they might see a majestic structure that emits the nuance of old times. No wonder, the office was built during the reign of the Dutch in Indonesia. No wonder, both the architecture and design represent the characteristic of such nation. In front of the residence, a vast yard welcomes both the guests and tourists who come for a visit. A flagpole is also seen there as well as some big trees and small plants. The color of the structure is mostly white, symbolizing the purity. The question is what people can do in such place. Well, it is actually the home of the governor as well as a historical place. Unfortunately, only those who have got the permission are allowed to get inside. Have no worries, taking pictures in front of the building is allowed so do not forget to carry a camera when coming to the residence. The only rule is that visitors should not spoil the environment like littering. Even though eating and drinking are allowed during the visit, tourists should take care of the trash later. Apart from photography, tourists can learn a history about the building. As for the best information, they should hire a tour guide who can explain it! It is said the building has been there since 1881 and the first governor who used the structure was Van der Heijden. At the time, he was also called One-Eyed Governor! As the name suggests, he only had one eye due to injury he got from the local war. It is true the main attraction is the residence, but more interesting structures reside in the location. For example, it is the “Pendopo”. The fact is that it has a historical value because it belonged to the ancient Pendopo Kingdom. Some renovations were made, though. This explains why the structure has been influenced by modern architecture (especially the Dutch’s). Still, it becomes a good alternative for photography objects! The good news is that the Residence of Aceh Governor is located near to Banda Aceh. It takes only 15 minutes by driving as the distance is only 1.5 km. As for the route, tourists can take Elang Street and head directly to Kampung Baru. Have no worries. Many local transportation services are available in Banda Aceh.